London: John Lane, 1904. First Edition. BEARDSLEY, Aubrey, illus.. 4to, pp. 70. Frontis photo. With seventeen drawings, three of the drawings previously unpublished. Bright blue cloth, with "The Bodley Head" at the tail of the spine (see Lasner note) with gilt design and lettering. Cover little worn and bumped at corners and ends of spine, o/w a VG tight copy. Gallatin 33; Samuels-Lasner 141. Under the Hill and Other Essays in Prose and Verse. Book condition: Some minor bumping at extremities; a very nice copy. London & New York:: John Lane Publisher; The Bodley Head,, 1904.. First edition.. publishers blue gilt cloth.. Some minor bumping at extremities; a very nice copy.. 4to,. With Illustrations by the Author. With Frontispiece photo of Beardsley at Mentone in the room where he died, seventeen b & w drawings by Beardsley with all tissue guards intact, three of the drawings previously unpublished. London: John Lane, the Bodley Head, 1904 Embossed front board, lightly rubbed. Minor tear to page 63-64, otherwise a nice copy. (Samuels-Lasner 141). First Edition. Hardcover. Good/No Jacket, as Issued. Illus. by Aubrey Beardsley. 4to - over 9¾" - 12" tall. Under the Hill and Other Essays in Prose and Verse ..
Book condition: Publisher's illustrated green cloth with gilt design by Beardsley. Light wear to extremities, sporadic heavy foxing to text. SOUS LA COLLINE (Under the hill); Et d'autres essais in prose et en vers par..
Paris: H. Floury, 1908. First French edition. BEARDSLEY, Aubrey, illus.. Small 4to, pp. 127. In French. One of 1000 copies. With preface and original portrait by Jacques Blanche. Frontis photo. With several Beardsley illustrations and bookplate. TEG. Gray paper over boards, stamped with gilt and red lettering. Cover slightly worn at corners and at ends of spine, o/w VG. 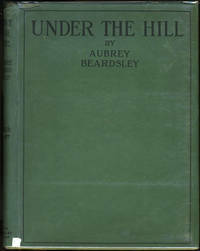 Under the Hill and Other Essays in Prose and Verse. With Illustrations. London: John Lane, 1913 Second edition. The first edition was published in 1904. Green cloth stamped in gilt, Top edge gilt. . Quarto. Title page printed in black and red. Photogravure frontisportrait. Fifteen black-and-white illustrated plates with tissue guards; title page of Volume I of "The Yellow Book" and frontispiece to "Plays" by John Davidson also included; tailpiece. Binding extremities lightly frayed and some light browning and soiling to the spine. Offsetting from frontisportrait to tissue guard; browning and offsetting from plates to tissue guards. Previous owner's ink signature on the top of front fly leaf. A very good copy of an attractive book. 2005-01-07. New. Ships with Tracking Number! INTERNATIONAL WORLDWIDE Shipping available. Buy with confidence, excellent customer service! 2010-09-10. Good. Ships with Tracking Number! INTERNATIONAL WORLDWIDE Shipping available. May not contain Access Codes or Supplements. May be ex-library. Shipping & Handling by region. Buy with confidence, excellent customer service! London & New York: John Lane the Bodley Head, 1921. Fourth edition. Hardcover. 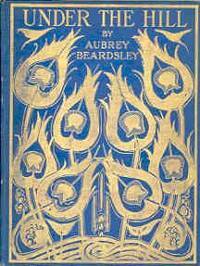 Under the Hill and Other Essays in Prose and Verse by Aubrey Beardsley with Illustrations. 4to, xvi, 70 pp & 4pp adds. Photogravure frontis, 16 plates by Beardsley (3 illustrations are published for the 1st time). Publisher's original green cloth with gilt lettering on upper cover and spine. Fine copy with crisp pages and plates as well as it's dust jacket. Beardsley was an illustrator and writer, "notorious in the 1890s as the outstanding artist of fin-de-siecle decadence." [Oxf Comp]. This volume is a collection of Beardsley's literary remains, including the dedication and text of "Under the Hill," "The Three Musicians," "The Ballad of a Barber," a translation of Catullus, "Table Talk," and two letters. 2015-02-19. Good. Ships with Tracking Number! INTERNATIONAL WORLDWIDE Shipping available. May not contain Access Codes or Supplements. May be ex-library. Shipping & Handling by region. Buy with confidence, excellent customer service! 2015-10-05. New. Ships with Tracking Number! INTERNATIONAL WORLDWIDE Shipping available. Buy with confidence, excellent customer service! 2015-10-05. Good. Ships with Tracking Number! INTERNATIONAL WORLDWIDE Shipping available. May not contain Access Codes or Supplements. May be ex-library. Shipping & Handling by region. Buy with confidence, excellent customer service! 1974-11-01. Good. Ships with Tracking Number! INTERNATIONAL WORLDWIDE Shipping available. May not contain Access Codes or Supplements. May be ex-library. Shipping & Handling by region. Buy with confidence, excellent customer service! Paris: The Olympia Press, 1959 Under The Hill, or The Story of Venus and Tannhauser, in which is set forth an exact account of the manner of state held by Madam Venus, Goddess & Meretrix Under The Famous Horselberg and Containing The Adventures Of Tannhauser InThat Place (etc. etc.) Completed by john Glassco.122 pp. uncut. With 9 very fine full pp. plates by Beardsley. A pristine copy in a fine, moiree, green, silk binding with gilt lettering and "gold" endpapers. Published in a limited edition of 3000 copies only, this is # 812. At Beardsley's untimely death, this work remained unfinished, and was completed by John Glassco. A very fine copy. Paris: The Olympia Press, 1959. Classic Beardsley with ten black and white illustrations including 8 full pg. ones. Nice green moire boards with gilt lettering and gold endpapers. One teeny tiny soil spot to the margins of two pages, and the usual light fading to the spine.The original plastic slipcase has some light wear, tears, but otherwise the book is in nice condition. . Limited Edition. Boards with Plastic Slipcase.